But anyone who knows anything about Harper should not be surprised that he will be dancing in Dayton a week from now. Despite being picked by the media to finish dead last in its division, Jacksonville State completed a remarkable run on Saturday in Nashville with a 66-55 win over UT-Martin. 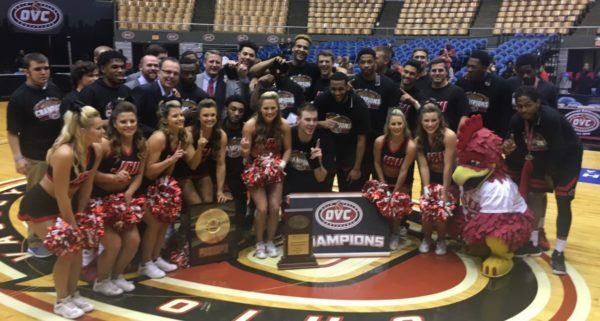 The Gamecocks achieved the feat just one night after stunning prohibitive favorite Belmont, which had finished the regular season with a 15-1 OVC record that included two easy wins over them. In outlasting the Skyhawks in the championship game, the Gamecocks controlled the action throughout and were never really threatened. As usual, they were led by three outstanding guards: Erik Durham, Greg Tucker and Malcolm Drumright, who was named tournament MVP. Harper may not be very well known to many college basketball fans, but his ability to win wherever he’s been is proof of his acumen. He won two Division II national championships at Kentucky Wesleyan in the 1990s followed by two NAIA titles at Oklahoma City in the late 200os. After taking over on an interim basis in the middle of the 2011-12 season, Harper led Western Kentucky to consecutive NCAA Tournaments before the school made the jump to Conference USA. His career record of 463-136 at numerous levels of basketball includes zero seasons with a losing record. And despite a good record of 90-62 in just under five seasons at Western Kentucky, Harper has never discussed why he left Bowling Green — although he resigned immediately after the suspension of three of his players. Regardless of the bizarre circumstances that led him to Jacksonville State, the Gamecocks were happy to get him. “I love him and appreciate him,” Tucker said after Saturday’s championship victory. Both he and fellow senior Durham said they knew that the NCAA Tournament was a realistic goal when Harper arrived on campus. For his part, the well-traveled head coach ignored the preseason prognostications. “I have some good friends in this business. I told them I don’t know where we’ll finish [in the OVC], but I can damn sure tell you we won’t finish last.” Harper, who benefited from inheriting solid veteran leadership, made good on that promise and then some. The Gamecocks carried their third-place finish in the East Division to a first-round bye in the OVC Tournament. After the upset win over Belmont, getting to the Big Dance was their destiny. Now, with a possible First Four game on the horizon, a win in the NCAA Tournament is a realistic possibility. With Harper leading the way, it would be pure folly to bet against him. This entry was posted on Monday, March 6th, 2017 at 3:01 pm by David Changas	and is filed under microsites, other 26. Tagged: erik durham, greg tucker, Jacksonville State, malcolm drumright, ovc tournament, ray harper. You can follow any responses to this entry through the RSS 2.0 feed. You can leave a response, or trackback from your own site.